Thomas, Eileen Mitchell. "Zoning". The Canadian Encyclopedia, 16 December 2013, Historica Canada. https://www.thecanadianencyclopedia.ca/en/article/zoning. Accessed 21 April 2019. Zoning is the term used to describe the control by authority of the use of land, and of the buildings and improvements thereon. Areas of land are divided by appropriate authorities into zones within which various uses are permitted. Any buildings to be constructed thereon are designated for certain uses and their size, location and appearance are regulated. Zoning is thus at the heart of development control by which responsible governments spell out both their immediate and long-range land use goals (see URBAN AND REGIONAL PLANNING). In Canada the control of land and its uses is a provincial responsibility. It is derived from the constitutional authority over &QUOT;property and civil rights&QUOT; granted to the provinces under the BNA Act of 1867 and carried forward in the Constitution Act, 1982. 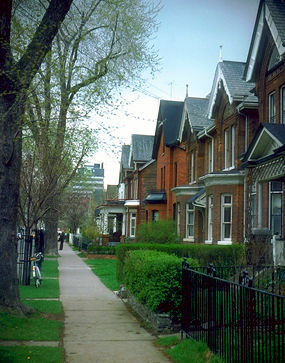 The zoning power relates to &QUOT;real property,&QUOT; or land and the improvements constructed thereon that become part of the land itself (in Québec, &QUOT;immeubles &QUOT;). Each province has established municipalities and regions that are empowered to control the use of land within their boundaries. Provision has also been made for control of land use in unorganized areas of the province. In both areas provincial tribunals are the ultimate authority for appeal and review. In Ontario a recent amendment permits the provincial government to affect the exercise of this power in that the official plans must comply with provincial policy statements. Each municipality may enact bylaws to control the use of land within its boundaries. Plans are made by the municipality, and the land area is divided into zones, each zone being set apart for certain defined uses. Plans are based on geographic features and existing development such as harbours, railways, highways, buildings and land use. Bylaws are then enacted to restrict the use of land in the defined areas to those uses established by the planning process. There are many uses for land: agricultural; forest; highways; parks; industrial (abattoirs, factories, warehousing, etc); commercial (from corner groceries to high-rise office complexes); residential (from single homes to high-rise apartments and to condominiums). Each use ascribed to an area sets the value on the land affected and establishes the profile of a municipality. Their common aim is to allow uses that do not harm one another to be clustered together in the same zone, while keeping &QUOT;incompatible&QUOT; uses apart in their separate zones. On the outskirts of cities, by contrast, land may be held under a general zoning category that simply indicates that it is scheduled for development one day. The detailed zoning map cannot be drawn until a detailed development plan has been approved. Some of the outlying land may also be zoned for agricultural use or for a green belt, if it is not needed for urban development in the foreseeable future or if the municipal government wishes to prevent the city from expanding farther onto rural land (see NATIONAL CAPITAL COMMISSION). In rural municipalities, zoning is mostly used to protect agricultural land from urban or industrial development. In addition to separating incompatible uses, the main objective of zoning is to control the intensity with which land is used. In residential districts, for example, there will often be a limit on the number of dwelling units that can be built per acre or hectare. Lot dimensions will also be regulated, and there is an obvious difference in the intensity of development between use zones that permit detached houses on 20 m frontages and those permitting row houses on 5 m frontages. Where the bylaw provides for high-density development, it establishes this density by defining the floor-space index (fsi) that will be permitted on the parcel being dealt with. For example, in a downtown core all land may be zoned commercial with an fsi of 8:1. This means that the office building to be constructed thereon can have 8 times the land area of the parcel as floor space. This could result in an 8-storey building covering the entire lot or, taking into account setbacks from streets or neighbouring buildings, or special designs with patios, etc, could even result in a 16-to 20-storey tower. Many urban municipalities now offer &QUOT;incentive zoning&QUOT; or &QUOT;bonusing&QUOT; to encourage developers to add features to their buildings. For example, in return for constructing an enclosed garden or an elevated walkway to an adjacent building, a developer may be allowed to exceed the fsi for the district (see DEVELOPMENT INDUSTRY; URBAN DESIGN). Power is given to departments of government to &QUOT;designate&QUOT; a use of land; in Québec a line is drawn called a &QUOT;homologated line,&QUOT; which puts the owner on notice that a special use may be made of some property - a highway, a road widening, a public park - and that nothing can be done on the land so affected until the final decision is made. The value of the land is established as of the date of designation. Traditional zoning has often been criticized for its inflexibility, but techniques like incentive zoning indicate that municipal governments in Canada are willing to look for more flexible approaches to the regulation of land use. Another example is the transfer of development rights. Under this technique the right to a particular type of development may be transferred to a site that does not have the appropriate zoning, on condition that the use of the original site is not changed. This is especially important if the original site is zoned for more intensive use but is occupied by a building that the city council would like to preserve for either historic or architectural reasons (see HERITAGE CONSERVATION). In practice, zoning has been most effective at preventing change in stable, homogeneous districts. It has created the greatest difficulty when applied to areas of mixed land use or to areas where there are great pressures for change. In the former case there have been 2 standard approaches, though both are controversial. The first is &QUOT;spot zoning,&QUOT; or picking out single sites for a class of use that is incompatible with the surrounding uses. A factory in a residential district would be an extreme example. The alternative approach, which is generally preferred, is to classify the factory as a &QUOT;nonconforming use.&QUOT; This means that it can remain, on condition that there is no change in the industrial use and no alterations to the buildings. Eventually, it is expected that the factory will be closed, allowing the site to be put to a compatible use. In areas under development pressure, it is difficult to determine in advance the exact zoning that will be required. The needs of communities and of landowners and developers are in constant flux. As a consequence, particularly in rapidly growing cities, there is a continual demand for amending bylaws to change the use classifications of particular parcels of land. On one side there is pressure from developers who want sites to be &QUOT;up-zoned&QUOT; to permit redevelopment for more intensive use, such as apartments or office towers. On the other, community groups have organized to request &QUOT;down-zoning&QUOT; to prevent further redevelopment and to preserve whatever remains of their original neighbourhood. As can be seen from these examples, zoning is often a contentious political issue that has to be settled by public debate and sometimes by court decisions. The need for land-use controls is now well accepted in Canada, however, and has gained strength from the increasing awareness of the public that land is owned in trust for future generations and is not owned for immediate profit. This is also reflected in the awareness by citizens and public authorities of their respective rights and duties. In many Western societies, notably in Europe, there is little freedom for an owner of land to control its use. In Canada, too, owners have given up certain rights, or have had them taken away, on the grounds that the good of the community now and in the future is more important than the individual's rights. Thus, our laws are becoming more stringent and the planning of land use enters the life of every citizen. M.A. Goldberg, Zoning: Its Costs and Relevance for the 1980s (1979); S.M. Makuch, Canadian Municipal and Planning Law (1983).